Dennis Hodgson is a contributing author, "Demography: History Since 1900", pp. 176-181. 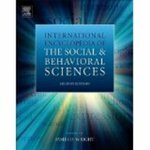 Book Description: Fully revised and updated, the second edition of the International Encyclopedia of the Social and Behavioral Sciences, first published in 2001, offers a source of social and behavioral sciences reference material that is broader and deeper than any other. It comprises over 3,900 articles, commissioned by 71 Section Editors, and includes 90,000 bibliographic references as well as comprehensive name and subject indexes. Hodgson, Dennis. "Demography: History Since 1900," in International Encyclopedia of the Social & Behavioral Sciences, 2nd edition, vol. 6, edited by James D. Wright (Oxford: Elsevier, 2015): 176–181. Wright, James D. and Hodgson, Dennis G., "International Encyclopedia of the Social & Behavioral Sciences, 2nd edition, vol. 6" (2015). Sociology & Anthropology Faculty Book and Media Gallery. 47.